Summary Ceiling-mount 2.4 GHz 802.11b/g/n AP/Bridge/Repeater based on Realtek silicon. 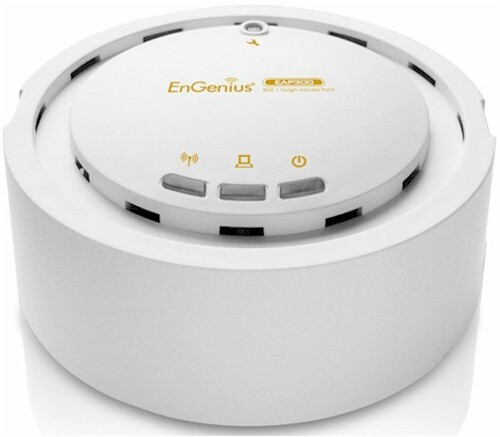 EnGenius has tried to differentiate itself from the wireless product pack by generally focusing on "long-range" products, typically with higher transmit power. In the case of the EAP-300, however, it looks like EnGenius has failed in this mission. The product is aimed at businesses who like their access points ceiling-mounted and inobtrusive. So the EAP-300 looks and mounts like a smoke detector. It can be powered by a 12v wall-wart (included) or more typically for a real business installation, by 802.3af Power over Ethernet. The top of the device has three bright blue indicators for power, Ethernet link/activity and Wireless link/activity. These can each be disabled in the admin interface. There is also a recessed button with a little wrench icon, whose function is not explained anywhere that I could find in the documentation. But I'd assume that it at least reboots the AP and possibly resets it to factory default with a longer press. The bottom of the device shown in Figure 1 has recessed ports for power and 10/100 Ethernet. There is a gap in the case at the top of the picture for cables to exit without making a bump in the flat mounting plane. The FCC ID photos are a bit fuzzy. But EnGenius isn't shy about providing design details in its data sheet. Table 1 summarizes the key components, which show a design based on Realtek components. I don't run across Realtek very often in wireless products and certainly not in those advertised as high performance. So I'm surprised at EnGenius' selection. Figure 3 shows an unobstructed view of the board where you can see the Realtek logos on the processor and radio devices. Figure 4 is a shot of the web admin interface so you can get an idea of the approach. If you've used an EnGenius router, the look and feel will be familiar; functional, but unpolished. Both HTTP and HTTPs connections are supported to the web admin interface. But if you just hit the AP's IP address, you don't get auto-forwarded to the secure interface; you need to specify https://. Check the gallery for screenshots of key admin pages and further commentary. The log can be viewed, but not saved or emailed. There are no event alarms. SNMP admin is supported as well as Telnet. Telnet is enabled by default and can't be disabled.